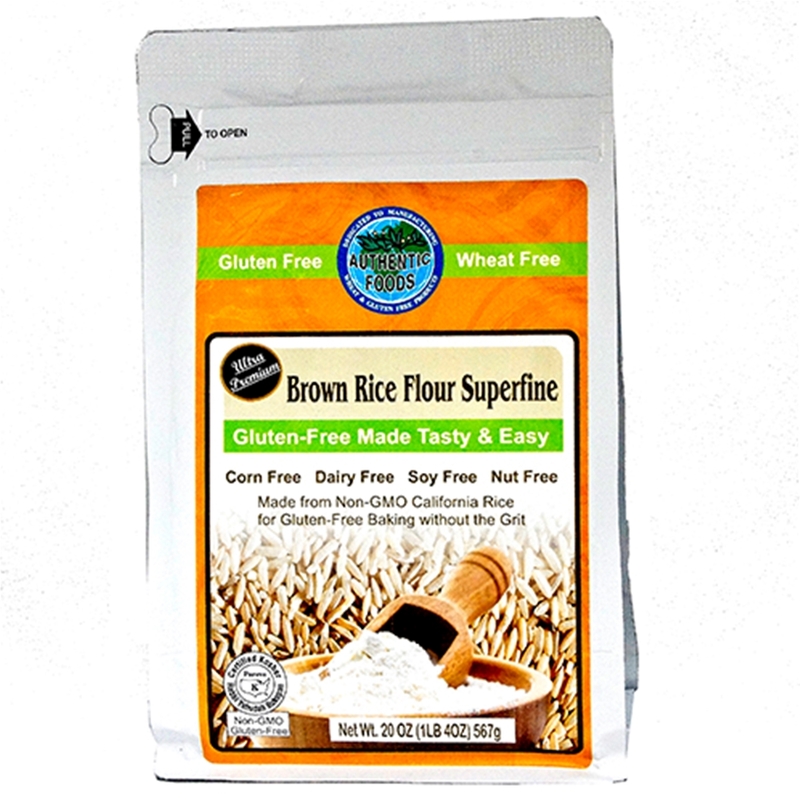 The Authentic Foods Superfine Brown Rice Flour is a gluten free flour made from the highest quality California medium grain rice and has the absolute best grain size for gluten free baking. Besides not having the grittiness associated with most rice flours, the Authentic Foods Superfine Brown Rice Flour contains more vitamins, protein and fiber than many flours such as white rice flour. It contains approximately 7% protein, 70% carbohydrates, 5% dietary fiber and 2% fat. It is often used in gluten free baking as a substitute for wheat flour when combined with other gluten free flours. This is a great product at a good price. Since I have celiac disease and need to maintain a gluten-free diet, my wife makes all my bread, desserts, etc and the extra fine brown rice flour makes for excellant texture and taste. So far it has been worth it to have this superfine flour for gluten-free baking. This flour addresses one of the problems with gluten-free baking; the occasional gritty texture of the finished product. Authentic Foods is the only vendor I've found who sells superfine milled flour. Quality item. If you're gluten intolerant, you will NOT be disapointed in this product! The brown rice flour I bought was/is wonderful. This flour is exactly what I have needed for my gluten free baking. This product is wonderful, and is making a big difference in our gluten free baking. It's the only place I can find superfine brown rice flour. Makes a big difference in baking. I LOVE the product, there is no rice flour better than the superfine...makes gluten free baking almost like regular. This is the best gluten free flour I have found, and the quality of the flour is unparalleled. A rice flour this fine is difficult to find and a must for light, tender gluten-free baked goods. This flour is great for baked goods. I use it when I make cookies and cakes. It isn't gritty like other rice flours. In a medium bowl mix all dry ingredients: Authentic Foods Superfine Brown Rice Flour, Authentic Foods Superfine Sweet Rice Flour, Authentic Foods Tapioca Flour, Authentic Foods Vanilla Powder, salt, baking powder, baking soda, and Authentic Foods Xanthan Gum. Cut the butter into small cubes. Add the butter to the dry ingredients and mix until there is a course crumb consistency (you can obtain the best result by using a kitchen aid mixer with a paddle to mix the butter into the dry ingredients). Then mix in the egg and milk to the mixture until smooth. If you would like to make chocolate chip cookies, then fold in the chocolate chips.